I don’t know about you, but when I travel to a new city, much less a new country, I just assume I’m not going to take the cheapest transportation from the airport. Extra doubly true when I can’t speak the language. After a long flight, I just want to get in and take the easiest possible transportation to my hotel. That usually means it’s a lot more expensive than it needs to be. This was also true when I flew into Suvarnabhumi Airport in Bangkok, Thailand. It took me 35 hours to get from Denver to Bangkok, and I didn’t get in until 10:30pm. Needless to say, I wasn’t about to try figure out the local train schedule or if it even came close to HQ Hostel where I was staying. I bought a ridiculously priced taxi ride and collapsed as soon as I got into my bed. It was easy, and it was worth it. Now that I’ve been here an entire day and had a chance to figure things out (slightly), I can tell you that taking Bangkok Transit Service (BTS) public transportation is the way to go if you’re alert enough and not drained from travel. The trip from the airport to my hostel on Silom Road would have cost less than $5. This is going to sound a little complicated, but if you follow along with the maps below, you’ll get it. Do a little research ahead of time on Google Maps and figure out which stop along Silom Road you need, and you’re done. For HQ Hostel and the Patpong district, get off at Sala Daeng (S2). 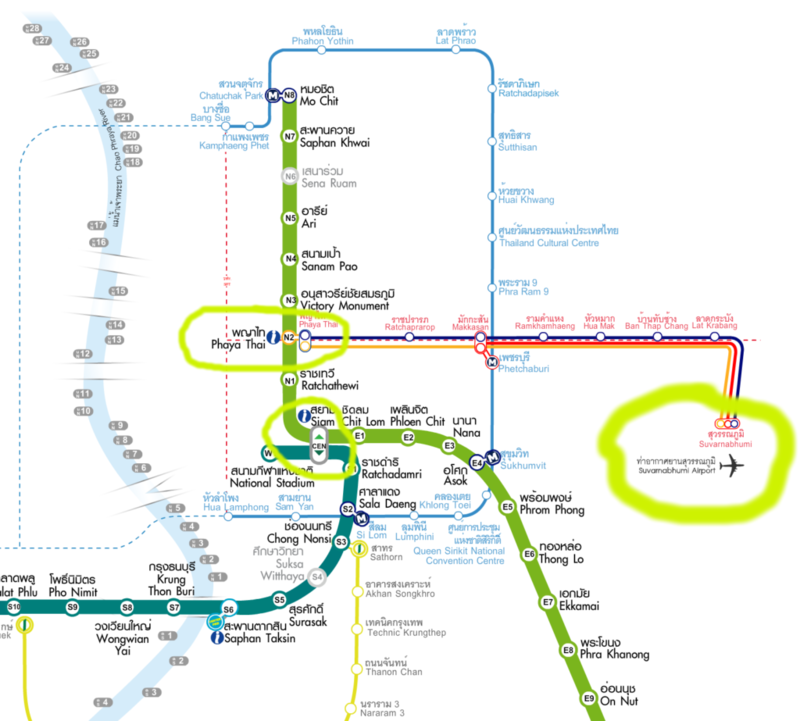 Is it also possible to go from the airport to Makkasan and then transfer to Silom with the lightblue line (I think it’s the metro)? Yes, absolutely! I didn’t learn about the MRT line until my last couple of days in Bangkok. That would certainly get you to the same area with one less transfer. Great point! However, I found that taking the MRT was a little more confusing than BTS in general. So if you’re just landing here for the first time, you may still want to stick to what I mentioned in the post.